Over 150 Listings Many Hard To Find Species! Scientific Name: Tradescantia Spathacea Sw. The Oyster Plant, also called the purple-leaved-spider-wort or the Boat lily, is a fleshy or succulent perennial garden herb belonging to the plant family Commelinaceae. The plant grows to a height of 30 to 60 cm. and the simple leaves that form a rosette are sword-like. They are 3 to 5 cm. wide and 15 to 45 cm. long. 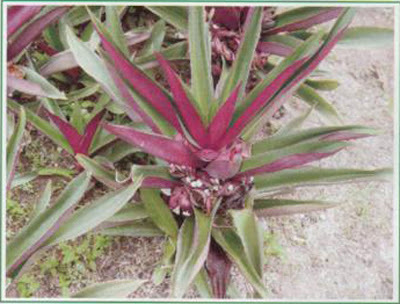 The plant can be easily identified by the dark green color on the upper surface of the leaves and the reddish purple color on the under surface. The stem is thick and unbranched. There are numerous tiny white flowers that are clustered at the leaf axils and lodge inside the boat shaped bracts. The flowers are open in the mornings. This plant is an ornamental plant and found in many tropical countries. Being a succulent and hardy plant, it can survive floods as well as droughts. Colds, sore throat and whooping cough. The decoction of the flowers and leaves is recommended for colds, sore throat, whooping cough, nasal bleeding, bacillary dysentery and blood in the stools. A poultice made from the crushed or ground leaves may be applied externally to reduce inflammations or swellings.